Line-up of local dignitaries, some on horseback, at Skipton Castle. 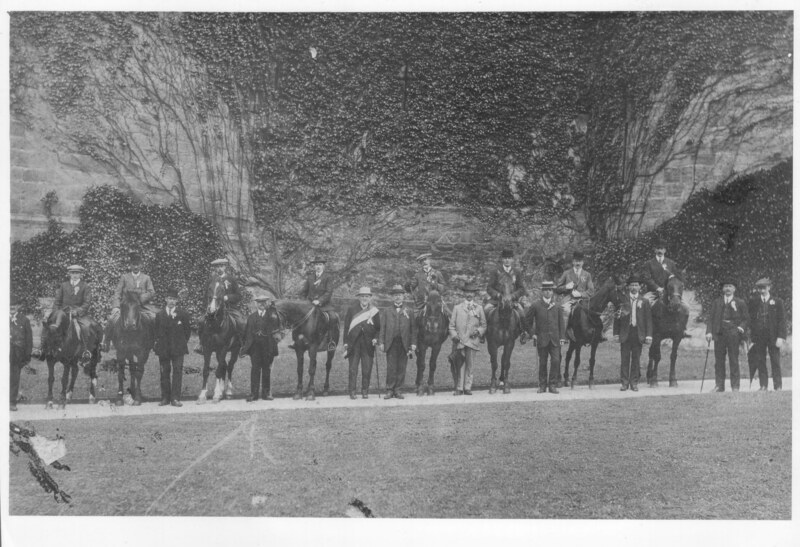 Mr J. Mallinson, Mr G. Langley, Mr M. Kerrigan, Mr W. Phillip (on horse on left hand side), Mr J. Foulds, Mr J. Chew. Mr Martin Kerrigan, my grandfather, is standing between two horses wearing a straw boater. He would have been surprised to be called a "dignitary" as he worked as a twister at Union Mills and lived in Upper Union Street. Even though he was an ordinary working man he was highly regarded in Skipton being invited to lay one of the foundation stones for the General Hospital on Keighley Road. He and his wife Sabina nee Towns had three sons John, James Henry (Harry) who was my father, and William (Billy).